Chloroplast biogenesis is blocked by retrograde signaling triggered by diverse internal and external cues, including sugar, reactive oxygen species (ROS), phytohormones, and abiotic stress. Efficient chloroplast biogenesis is essential for crop productivity due to its effect on photosynthetic efficiency, and is associated with agronomic traits such as insect/disease resistance, herbicide resistance, and abiotic stress tolerance. Here, we show that the circadian clock-controlled gene GIGANTEA (GI) regulates chloroplast biogenesis in Arabidopsis thaliana. The gi-2 mutant showed reduced sensitivity to the chloroplast biogenesis inhibitor lincomycin, maintaining high levels of photosynthetic proteins. 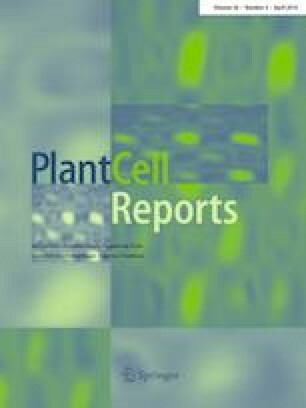 By contrast, wild-type and GI-overexpressing plants were sensitive to lincomycin, with variegated leaves and reduced photosynthetic protein levels. GI is degraded by lincomycin, suggesting that GI is genetically linked to chloroplast biogenesis. The GI mutant alleles gi-1 and gi-2 were resistant to the herbicide butafenacil, which inhibits protoporphyrinogen IX oxidase activity and triggers ROS-mediated cell death via the accumulation of chlorophyll precursors. Butafenacil-mediated accumulation of superoxide anions and H2O2 was not detected in gi-1 or gi-2, as revealed by histochemical staining. The activities of the antioxidant enzymes superoxide dismutase, peroxidase, and catalase were 1.2–1.4-fold higher in both gi mutants compared to the wild type. Finally, the expression levels of antioxidant enzyme genes were 1.5–2-fold higher in the mutants than in the wild type. These results suggest that GI negatively regulates chloroplast biogenesis and resistance to the herbicide butafenacil, providing evidence for a genetic link between GI and chloroplast biogenesis, which could facilitate the development of herbicide-resistant crops. The online version of this article ( https://doi.org/10.1007/s00299-019-02409-x) contains supplementary material, which is available to authorized users. Joon-Yung Cha and Da-Yeon Lee authors have contributed equally to the work. This study was supported by grants from the Cooperative Research Program for Agriculture Science & Technology Development (project no. PJ010953042019), Rural Development Administration, and the National Research Foundation of Korea (Grant 2017R1A4A1015515), Republic of Korea.